Comes as no surprise that corinthianos need to be taught a lesson both on and off the pitch… (correct grammar would read “um bando de loucos que… nunca vai te abandonar”). Previous thank you / obrigado !!! in this picture we can see a typical Corinthians fan. Have you already heard about “Artistic license” or “Poetic License” ? That was a music, song and it is not a mistake. I don’t know whether you know a band called “The Beatles” and its song “Ticket to Ride”… Do you thing that they wrote “She’s got a ticket to ride, but she don’t care…” because they were corinthianos ?? Thanks for your comments (the first from a non-palmeirense, I believe), they are very welcome, as are comments from anybody else. I do know about artistic/poetic license. And I do know the song “Ticket to Ride”, as well as The Beatles. But what I didn’t know whas that the phrase on the Corinthians t-shirt was a song. Or, let me be more specific: I did know that the first part refers to a song (“Bando de Louco” or “Loucos por ti”, it has many names). But the second part, “nunca vão te abandonar”? That piece of lyric does not, to my knowledge, belong to the song. Correct me if I’m wrong. Of course you can claim “artistic freedom” in anything you like. But I think it looks sloppy. Especially when, as in this case, it’s NOT part of the song. Thus, why do it wrong if you can do it right? Something for you to think about. Maybe he got these two songs and created a new song with “artistic freedom” 🙂 . 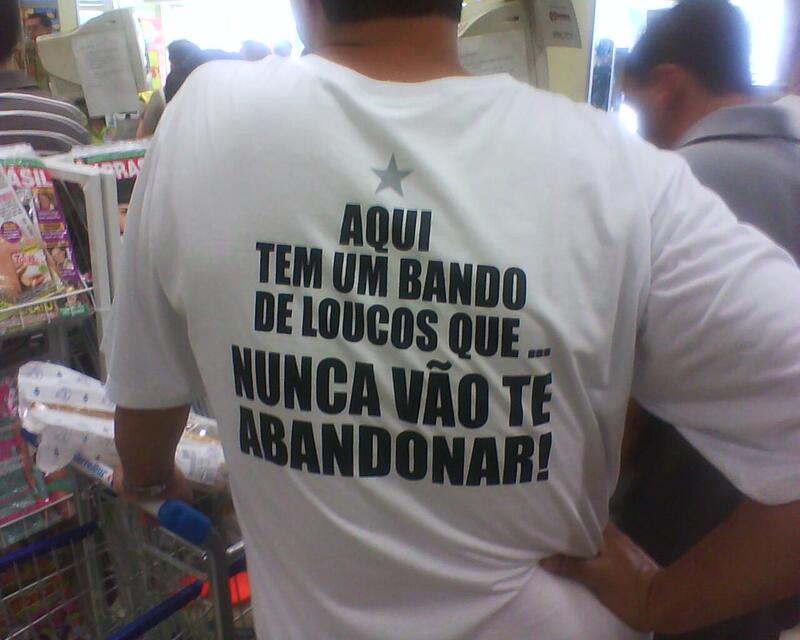 Moreover, I was refreshing my memory about “Concordância Verbal” and the t-shirt can be right. “O coletivo funciona como sujeito, acompanhado de restritivo no plural: Nesse caso, o verbo tanto poderá ficar no singular, quanto no plural. Ex. A multidão de torcedores invadiu / invadiram o campo após o jogo. O bando de pássaros sobrevoou / sobrevoaram a cidade. Great research. I had a chat with my wife yesterday (she’s a journalist) and she hinted towards the same possibility as you explained in regard to the concordância verbal, although she wasn’t 100% sure and in any case dismissed it as “those new rules that wreck our langauge” or something like that. Thanks for a balanced and informative exchange of ideas! Take care, volte sempre!